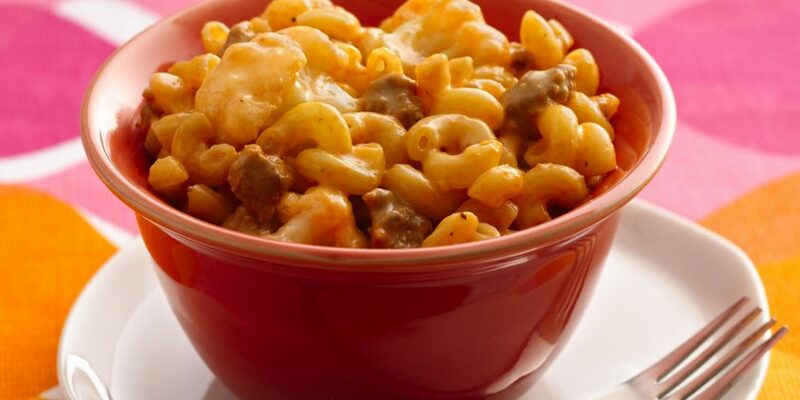 Mac and cheese and cheeseburgers are two of the most beloved comfort foods on the planet. This better-for-you recipe will satisfy both cravings at once! Bonus: It cooks up easily in a slow cooker and clocks in at under 200 calories per serving. 1. In a large pot, prepare pasta very al dente, cooking for about half of the time indicated on the package. Drain well. 2. Meanwhile, combine turkey, ketchup, and onion. Mix well. Add frozen cauliflower and cheese sauce and gently mix. Transfer mixture to a slow cooker. A 4-qt. slow cooker is best. 3. Add cooked pasta, and gently stir. Cover and cook on high for 3 – 4 hours or on low for 7 – 8 hours, until turkey is fully cooked. 4. Add cheese wedges and scallions, and stir until evenly distributed.